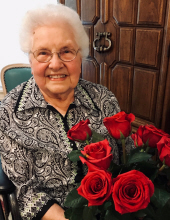 Naomi Stone Warlick, 92, of Shelby, passed away Friday, January 25, 2019 at Brookdale in Shelby. Born in McDowell County, West Virginia, on May 26, 1926, she was a daughter of the late James Daniel Stone and Rita Evelyn Taylor Stone. Mrs. Warlick began her working career at US Steel and would move on to help her husband with his insurance company. However, her greatest work was caring for her family and friends. Her home was always open and welcoming, to entertain angels unawares. She had a deep and abiding faith in her loving God and was an active member in her Faith. In addition to her parents she is preceded in death by her beloved husband Samuel Eugene Warlick; five brothers, Sam Stone, John Stone, Buster Stone, Daniel Stone, and Glen Stone; and two sisters, Georgia Hagy and Carrie Smith. She is survived by her two daughters, Deborah Morton and husband Larry of Charlotte and Beth Lindsay and husband Reid of Shelby; seven grandchildren, Eric Morton and wife Shelly, Paul Morton and wife Heather, Philip Morton and wife Emily, Emily Morton Webb and husband Bradley, Charles Lindsay, Megan Lindsay Stephens and husband Shane, and Laura Beth Richardson and husband Ryan; and thirteen great grandchildren, Mallory Morton, Madelyn Morton, Hatcher Morton, Carson Morton, Zoe Morton, Pippa Morton, Katherine Morton ,Adaline Webb, Isabelle Webb, Brooks Webb, Miles Webb, Naomie Webb and Baer Richardson. The family will receive friends on Monday from 1:00 PM to 2:00 PM at Stamey-Tysinger Funeral Home, Fallston, NC. The funeral service will be held on Monday at 2:00 PM in the Stamey-Tysinger Funeral Home Chapel with Mr. Jim Holt, Mr. Tom Nussbaum, Mr. Ken Pinney and Ms. Wanda Skilbred presiding. The burial will follow the service in the Rose Hill Memorial Park. To send flowers or a remembrance gift to the family of Naomi Stone Warlick, please visit our Tribute Store. "Email Address" would like to share the life celebration of Naomi Stone Warlick. Click on the "link" to go to share a favorite memory or leave a condolence message for the family.